Posted by Destin Real Estate Sales on Thursday, May 29th, 2014 at 12:05pm. Destin and South Walton commercial real estate has literally “boomed” over the past thirty years. Longtime visitors and local residents are amazed at the transformation of this part of the Emerald Coast over the years. Back in 1980 nothing was built along Emerald Coast Parkway from Sandestin all the way to Destin itself because it did not even exist until 1987! Up until this time all of Highway 98 from Destin to Panama City Beach was a two lane road except for about a two mile stretch of four lane highway near a new development called Sandestin. Sandestin started in the mid 1970s but even as of 1980 there were no high rise condominium towers on the beach and the Hilton Hotel was just starting construction. The original Highway 98 which is now called Scenic Gulf Drive was a lonely two lane road that ran alongside the beach to Destin across mostly empty sand dunes. High rise condominium beach towers and many residential neighborhoods were built throughout the 1980s and 1990s along with many championship golf courses. This led to a real estate boom in associated commercial development, especially on the newly completed Emerald Coast Parkway. Shortly after 2001 Destin Commons and two other major shopping centers were completed at the junction of 98 and the newly completed Mid Bay Bridge Road. The Emerald Grand and Harborwalk Village in Destin were completed by 2006. Preplanned communities sprung up along Scenic 30A in South Walton at this same time following Seaside’s lead which had been started in the early 1980s. From 2002 to 2006 entire towns were completed along this route, some within less than twelve months time. They included Gulf Place at Santa Rosa Beach, Watercolor, Watersound, Alys Beach and Rosemary Beach. It was like “the wild west” for locals to see complete communities springing up which resembled fake Hollywood movie sets because they went up so fast you couldn’t even believe they were real! The Village of Baytowne Wharf and Grand Boulevard at Sandestin were also completed at this time. This all ended by 2006 and almost overnight there was not one board of new construction to be seen here for commercial or residential development for nearly five years. The recovery began around 2010 and all of a sudden Destin saw a new Lowe’s, Miller Ale House Restaurant, Rooms to Go and other commercial buildings being completed with many more to come. 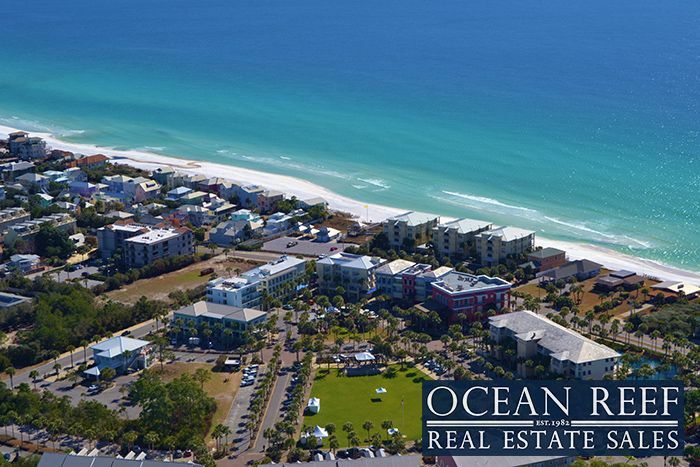 There have been sixty-three commercial real estate sales in Destin and South Walton over the past twelve months. These include completed buildings like restaurants, retail units in existing space, warehouse or industrial structures and vacant commercial parcels. The average price for all of those sold stands at $606,356. These ranged from $35,000 to $6,250,000 which were both for vacant commercial parcels. The property that sold for $35,000 was on Highway 98 near Inlet Beach with dimensions of 207 x 165 x 121. The $6,250,000 parcel that was zoned Multi-Use included approximately nine acres with 345 linear feet of frontage on Scenic 30A near the junction of Watersound Parkway two miles west of Highway 98. Currently there are 123 commercial properties for sale in this same area ranging in price from $55,000 to $7,000,000 with an average price at $1,049,000. The $55,000 property is for 612 square feet of office space with a waiting room and bathroom in an existing building on Airport Road in Destin. The $7,000,000 property is for three vacant commercial parcels totaling 10.21 acres on Emerald Coast Parkway in Miramar Beach across from Seascape Resort. Six commercial properties are currently under contract with a range listed from $449,000 to $3,900,000 for an average of $1,715,483. The $449,000 property is a vacant lot at Emerald Waters Place in Miramar Beach. The $3,900,000 is for a Mixed Village Use parcel of 4.67 acres on Scenic 30A east of the Highway 395 junction. It is zoned to include a variety of spaces for a hotel, restaurant, office, retail and/or residential uses. If you are looking to buy or sell commercial real estate in Destin or South Walton give one of our professional Realtors a call now at 877.392.6085!